Home » What is a Cochlear Implant and How Does it Work? A microphone that picks up sound from the environment. A “transmitter” connector which is held in place behind the ear by magnetism. The stimuli are then sent by electromagnetic induction (transformer coupling) through the skin to a secondary (4) similar pattern as above receptor array of wire conductors implanted under the skin of the patient. These stimuli, still in parallel array, are then routed through the wire conductors to specific locations within the cochlea which represent specific tonal receptors of the eighth cranial nerve, which in turn lead to the hearing sector of the brain.The cochlear implant (CI) is a surgically implanted electronic device that provides a sense of sound to persons who are profoundly deaf or severely hard of hearing. An implant does not “heal” a non-functioning cochlea or restore normal hearing, but it can give a deaf person enough useful reproduction of sounds to greatly enhance their capability to interpret sounds in the environment and to understand speech. Hearing aids simply amplify sounds. They require some portion of the normal hearing mechanism to be functional. Cochlear implants bypass damaged portions of the ear and directly stimulate the auditory (eighth cranial) nerve which routes sound stimuli directly to the hearing center of the brain, which in turn recognizes the signals as meaningful sound. Hearing through a cochlear implant is different from normal hearing and often requires time to learn the entire meaning of sounds if the patient was pre-lingually deaf, or to relearn prior sound interpretations if patients became deaf after learning to speak. 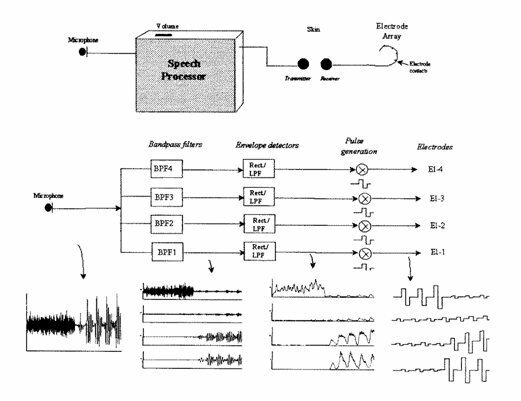 In recent years extensive and competitive experimentation has been performed by many manufacturers in an effort to exploit all possible methods of synthesizing and applying the detected electrical audio stimuli to the acoustic nerve, in a continual effort to achieve the maximum possible intelligence, fidelity and clarity of audio information. The preponderance of current implants is the outgrowth of the multi-channel design described in US Patent 4063048 (10). Also, many experiments by the House Ear Institute in single conductor implants have achieved success in specialized applications. Many new strategies for increasing the effective number of audio channels being applied to the acoustic nerve have been researched, thereby helping to provide greater fidelity in a true reproduction of original audio inputs. The American Speech & Hearing Association (AHSA) (32) has considered the cost of a cochlear implant, which varies quite widely from patient to patient. The cost varies even with respect to the location or institution from which an implant is received, since implants are available in many countries around the world. It also varies with the patient’s age, whether child, infant or adult, and with respect to the many causes and reasons for the patient’s deafness, including how long the patient has been deaf. According to the American Speech and Hearing Association, the average cost of an implant, which includes the entire surgical procedure, medical staff and hospital, plus operative medical and aural rehab is in the range of $40,000 to $60,000. Even at these seemingly exorbitant costs, researchers at Johns-Hopkins Hospital have shown that “more than $50,000 can be saved compared to the cost of more than $1,000,000 in expenses expected over a lifetime to cover the cost of children who are profoundly deaf”. Since all cochlear implants employ the same basic design (with many ancillary variations) and have a similar range of performances, other criteria are considered when choosing a cochlear implant and comparing costs, such as the usability of external components, cosmetic factors, battery-life, whether replaceable or rechargeable, versatility of internal and external components, customer service from the manufacturer, experience of the implanting physician, qualifications of the audiologists with respect to mapping (software guided set-up for each patient), and the quality of familiarity of personnel with a particular device. The figure below represents the basic design of the cochlear ear implant patented by Adam Kissiah in 1977. Patent 4063048 Cochlear Implant, Adam Kissiah, Jr. The figure below illustrates the current design of the cochlear ear implant. 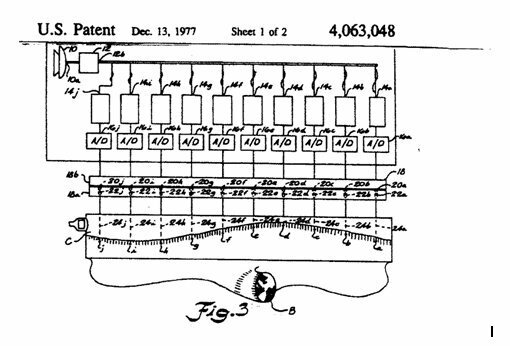 The basic design is virtually identical to the design from the original patent.